Andy Street Pays Tribute to Kite Packaging "A Hidden Gem in the Coventry Economy"
West Midlands Mayor Andy Street paid tribute to a business he called a ‘hidden gem in the Coventry economy’ during a visit to the city. The former John Lewis boss was given a presentation on the history of Kite Packaging, based at Torrington Avenue, by Managing Partner Gavin Ashe as well as a tour of the site. Kite Packaging, which was launched in 2001 as a ‘kitchen table start-up’, has similarities to John Lewis in that it has an employee-ownership philosophy, so staff get share benefits and can benefit from wider growth. The Mayor was joined by Coventry and Warwickshire Local Enterprise Partnership Growth Hub Strategic Account Manager Phil Peak on the tour, which saw the two business leaders meet with staff and employees to discuss day-to-day operations at the main operational hub of Kite Packaging, which also has sites in Rotherham, Swindon, Letchworth, Sittingbourne, Portsmouth and Gateshead. Andy Street said: “Learning more about Kite Packaging and meeting the staff has been a real eye-opening experience. “The company is a real hidden gem in the Coventry economy and a true success story where staff have been involved every step of the way. 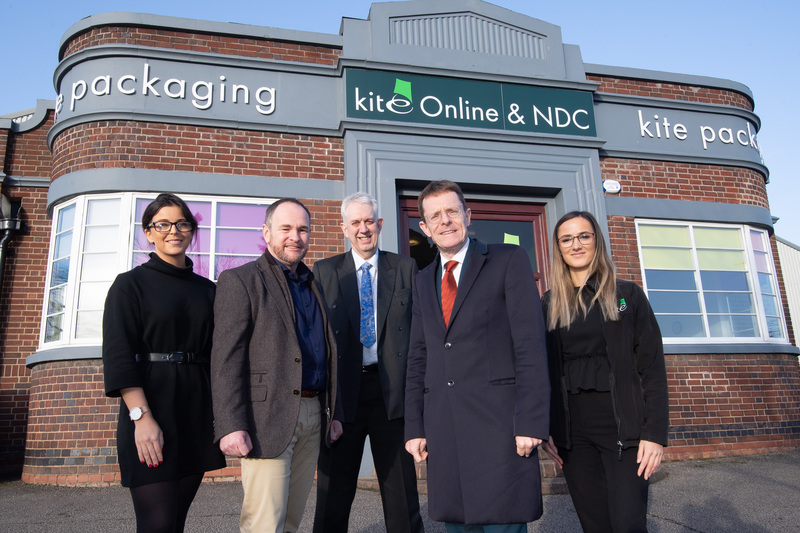 Kite Packaging has become one of the largest distributors in the UK in recent years, with its massively successful e-commerce operation and waste compliance business also based at Torrington Avenue. Managing Partner Gavin Ashe spoke with the Mayor and Phil regarding its businesses plans for the future, which includes expansion in the local area in order to meet growing demand. Gavin said: “On behalf of all the staff and partners at Kite Packaging, we’d like to thank Andy Street for the time he gave us. CWLEP Growth Hub Strategic Account Manager Phil Peak has worked with Kite Packaging for three years to help unlock support for growth opportunities and is striving to help them find suitable development land at the moment. He said: “It was great for Andy Street to see what an ambitious, well run and successful company Kite Packaging is. “At the Growth Hub, we are committed to helping businesses like this get to where they want to be through offering support and unlocking opportunities.